Objective: To determine whether seasonality of the sudden infant death syndrome persists now that rates have fallen, mostly after widespread adoption of the “face upwards” sleeping position. Design: Monthly data on the sudden infant death syndrome during 1987-9 were compared for seasonality with those of 1991-3; rates were studied as deaths per 1000 live births. Setting: Australia and Britain (England, Wales, and Scotland). Subjects: Infants under 1 year dying of the syndrome (2401 for Australia and 6630 for Britain). Main outcome measure: Extent of seasonal variation (amplitude) was established by cosinor analysis; amplitudes for the earlier and later years were compared. Results: The rate fell in every month, and, though it did so relatively more in winter than summer, seasonality remained a distinctive feature. In the comparison of amplitudes the ratio between the earlier and later years was 1.4 in both Australia and Britain. Some differences between the hemispheres were noted. Conclusions: Seasonality of the sudden infant death syndrome remains to be explained and continues to be an important aetiological lead. Studies from other countries are needed. The seasonality of sudden infant death syndrome was reported in 1855 by Wakley1 and in 1944 by Abramson,2 who was also the first to demonstrate the advantage of the “face upwards” sleeping position. The reappreciation and recommendation of this position3 4 5 6 7 8 has been followed by a dramatic fall in incidence, after an earlier period of more gradual decline,9 perhaps from other changes in infant care practice, such as avoidance of overwrapping and of exposure to cigarette smoke. Researchers in Australasia10 11 and in Britain12 13 have reported that this more recent fall has been predominantly in winter. We re-evaluated this conclusion by using two large series and including data for 1993—that is, after the precipitous part of the fall had occurred. Monthly data on the sudden infant death syndrome (International Classification of Diseases, 9th revision (ICD-9) code 798.0) were obtained from the Office of Population Censuses and Surveys (now the Office for National Statistics) for England and Wales and the General Register Office for Scotland, these being here combined as data for Britain. The periods 1987-9 and 1991-3 were compared to examine seasonality before and after 1990. Data for 1990 are also shown, but that year was treated as an arbitrary watershed between the slow9 and rapid declines in incidence of the syndrome. The sexes were combined, and the monthly rates of the syndrome per 1000 live births were established. Deaths in the first month of life were included. The main conclusions were drawn from the aggregated years, but data are also provided on single years. Cosinor analysis14 15 16 17 was used to assess seasonality. This technique is reliable provided that the data fit a single sine curve; the best fit of a cosine function curve to annual data is then calculated. In this analysis the year is taken as 360°, and the midpoint of each month of the year is assigned an angular value t for January (15°) through to December (345°). Multiple regression analysis is completed between monthly data and sine (t) and cos (t). This analysis gives the multiple correlation coefficient (r) its significance (P) and its angular position in the year where the fitted sinusoidal regression line has its highest value. The monthly rates for the earlier and later years in both countries are shown in figure 1 and table 1. The well known general seasonality is seen in figure 1. Figure 1 shows that seasonality was sustained in the later years but at a lower amplitude. The amplitude fell from 45% to 32% in Britain and from 35% to 26% in Australia, leaving a substantial seasonal difference. The ratio of amplitudes of earlier to later years was 1.4 in both countries. The cosinor analysis (fig 1) gives r values for the United Kingdom of 0.98 for 1987-9 and 0.95 for 1991-3 and for Australia of 0.90 for 1987-9 and 0.94 for 1991-3. All P values are <0.001. By changing the scaling on the ordinate in figure 2 the persistence of the seasonality in 1991-3 is made clearer. When the later and earlier years are compared the rates fell in every month of the aggregated data. The cosinor amplitude fell, and this was probably due to the falls in each winter month being relatively greater than those in each summer month. These data are shown in table 1 and support that conclusion. There are some differences between Britain and Australia. In table 1, January and July have been matched as being seasonal equivalents, and this shows that the relative fall began two months later in Australia than in Britain and continued for longer. The incidence of the sudden infant death syndrome fell during every month of the year (table 1). Though this fall was absolutely and relatively greater in the colder (and darker) months than in the rest, seasonal variation persisted generally. Given a six month shift in hemispheric phase, the results in the two hemispheres are similar. Though there are apparent differences between them in the pattern of relative fall, these could have arisen by chance. There has been interest in seasonality of the sudden infant death syndrome in many countries,18 and further investigation might clarify these differences. If they are genuine, this could be a latitude effect as Australia lies between the equator and mid-latitude and Britain between mid-latitude and the polar region. Latitude, and therefore length of day, differs considerably between Britain (50-60°C latitude) and Australia (10-40° latitude). Again, despite the broad similarity, the temperature differences between the two countries are considerable, ranging in London from 14°C to 4°C and in Sydney from 23°C to 12°C,19 a contrast which strongly suggests that absolute temperature differences alone do not explain the observed seasonal variation in the syndrome. It is interesting, however, that in studies in both countries Campbell found that the incidence of the sudden infant death syndrome was correlated with a fall in environmental temperature two to five days previously.20 In 1987-90 the extent of the seasonal variation in Britain was slightly greater than that in Australia, but in the single year 1993 it was almost the same (table 2); the results of a single year, however, must be viewed with great caution. Seasonality of the sudden infant death syndrome has always been an important epidemiological feature, and its importance as a source of possible clues to aetiology remains despite its contraction. Those who have suggested that it may be in the process of disappearing, as a byproduct of the fall in the incidence of the syndrome, were dealing either with small numbers or with a distorting period of rapid secular change in incidence.10 11 12 13 Moreover, each individual year of our data for Britain has had the albeit small advantage of addition of the Scottish figures to those of England and Wales. Only time, however, will tell whether seasonality will contract even further or, instead, will re-expand. We thank Dr John Rawles, who prepared the cosinor programme. We are grateful to the staff of the medical library and the department of medical illustration of Aberdeen University and to Dr R G Carpenter of the London School of Hygiene and Tropical Medicine for their cooperation. Mrs Muriel Burnett undertook repeated typing of the manuscript. Funding Part of this work was supported by the Scottish Cot Death Trust. ASD was also supported by the Maryland Medical Research Institute. .Infants found dead in bed.Lancet1855; i:103. .Accidental mechanical suffocation in infants.J Pediatr1944; 25:404–13. .Sudden infant death syndrome. Epidemiological comparison between South Australia and communities with a different incidence.Australian Paediatric Journal1986; 22(suppl):13–6. .Sleeping position and infant bedding may predispose to hyperthermia and the sudden infant death syndrome.Lancet1989; i:199–201. .Interaction between bedding and sleeping position in the sudden infant death syndrome: a population based case-control study.BMJ1990; 301:85–9. .Choice of sleeping position for infants: possible association with cot death.Arch Dis Child1990; 5:462–7. .Results from the first year of the New Zealand cot death study.N Z Med J1991; 104:71–6. .Can the fall in Avon's sudden infant death rate be explained by changes in sleeping position?BMJ1992; 303:282–3. .Numbers of infant deaths in Scotland, with special reference to sudden infant death syndrome.Health Bulletin (Edinb)1993; 51:106–17. .Which infants are no longer dying because of avoidance of prone sleeping?Med J Australia1994; 160:660. .Reduction in mortality from sudden infant death syndrome in New Zealand 1986-92.Arch Dis Child1994; 70:291–4. .SIDS: risk reduction measures.Early Hum Dev1994; 38:161–4. 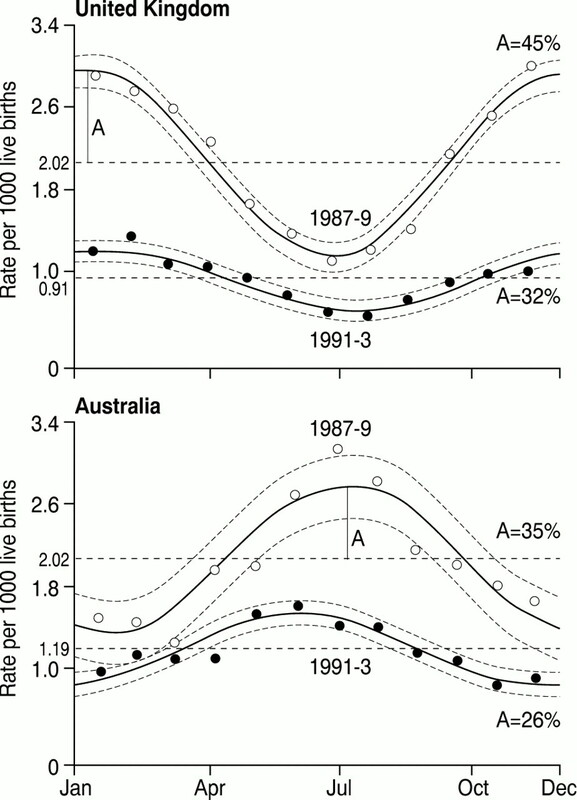 .Trends in rates and seasonal distribution of sudden infant deaths in England and Wales 1988-92.BMJ1995; 310:631–2. .Autorhythmometry—procedures for physiological self-measurements and their analysis.Physiology Teacher1972; 1:1–11. .Analysis of biological time series. In: Arendt J, Minors DS, Waterhouse JM, eds. Biological rhythms in clinical practice.London:Wright,1989:172–93. .Seasonality of disease in Kuwait.Lancet1991; 337:1393–7. 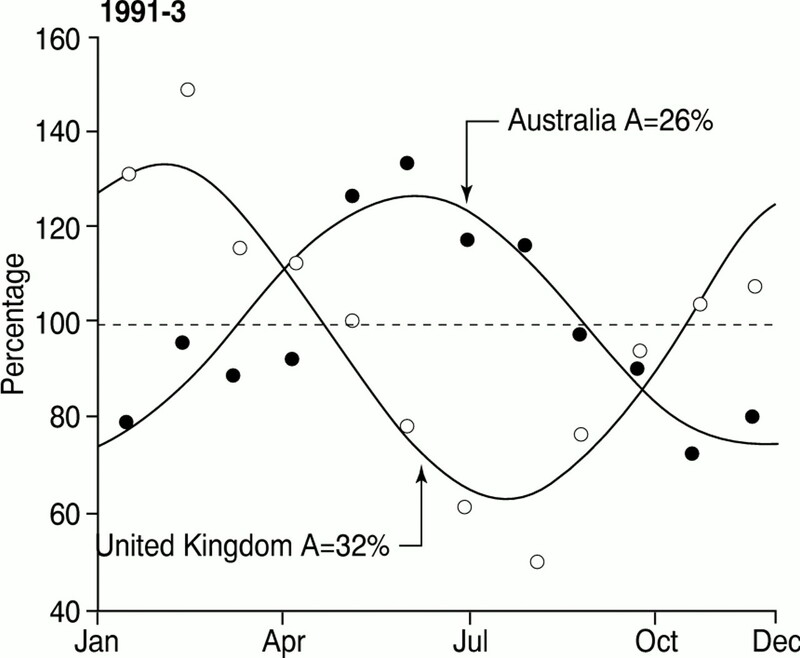 .Seasonal variation in health and diseases.London:Mansell,1994. .World weather guide. 3rd ed. Oxford:Helicon,1993. .An investigation into the relationship between sudden infant death syndrome and environmental temperature.Journal of the Statistical Society A1994; 157:191–208. .Interactions between thermoregulation and the control of respiration in infants: possible relationship to sudden infant death.Acta Paediatr1993; 389(suppl):57–9. .Why is there an increased risk for sudden infant death in prone sleeping? Fear paralysis and atrial stretch reflexes implicated?Acta Paediatr1994; 83:548–57. .Rebreathing expired gases from bedding: a cause of cot death.Arch Dis Child1993; 69:187–90. .Sudden infant death syndrome: a genetically determined impaired maturation of the photoneuroendocrine system. A unifying hypothesis.J Theor Biol1994; 167:13–25. .Melatonin and the mammalian pineal gland.London:Chapman and Hall,1995:207–11.